I’ve mentioned a few times that I’m testing out the maximum hydration method and will be uploading a whole series about my results in a few weeks. Occasionally, I write about some of the products I’ve stumbled upon during the experimentation. 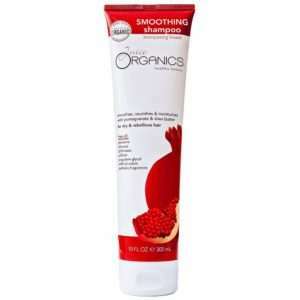 Juice Organics PomSmooth line is one of such products. Pomegranate oil is an excellent oil for dry hair and moisture retention. I covered it in two previous articles – Boost Wash & Go Results with Pomegranate Seed Oil and 3 Great Hair Products with Pomegranate Seed Oil. Juice Organics PomSmooth Conditioner is a blend of pomegranate, aloe vera juice, evening primrose oil, jojoba oil, borage seed oil and olive oil among other things (full ingredient list below). I wear my hair primarily in a wash and go whenever I do the MHM method. Based on my previous research regarding wash and go results with pomegranate seed oil, I decided to include this in my regimen for step 1. The conditioner is thick and smells fruity with pomegranate standing out. However, it’s not an overwhelming smell. I found it very moisturizing and it left my hair soft and detangled after leaving it in for only 5 minutes. I also use Juice Organics PomSmooth Conditioner for a co-wash midweek sometimes when I’m too lazy to do the full regimen. When used this way, it also leaves my hair shiny (yay). I am considering using it for the DC step in the next few weeks. From what I’ve glimpsed so far, I feel it might also help with frizz if left on the hair longer. Juice Organics PomSmooth Conditioner contains panthenol, which is on the no-no list of MHM but it’s far down enough down the list not to make much of a difference on my hair. Price point – $. 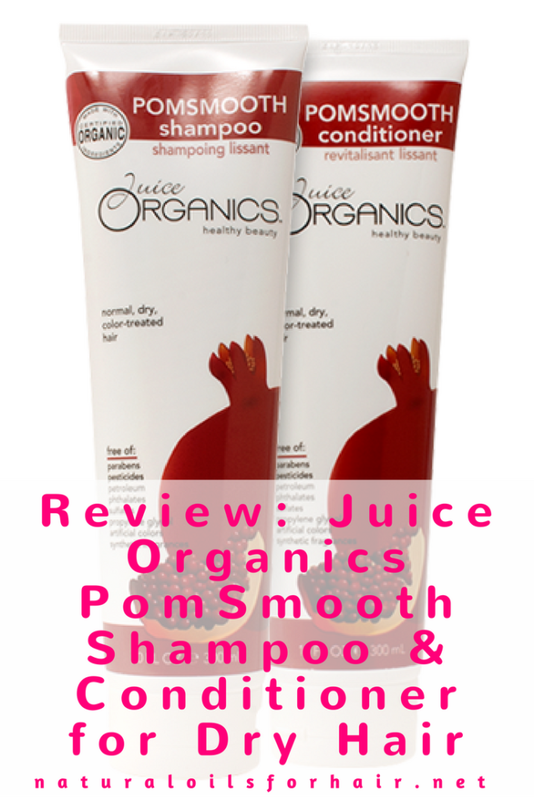 Learn more about Juice Organics PomSmooth Conditioner HERE. I don’t use shampoo much anymore but I bought this as a duo pack so I tried it anyway. Like the conditioner, the shampoo smells fruity with pomegranate standing out. Juice Organics PomSmooth Shampoo is sulphate and paraben free, which is always a plus with curly hair. The shampoo’s consistency is thinner than most and I had a hard time not wasting it whenever I used it. A product this thin would work best in a pump bottle and not a tube. Overall, I loved the shiny effect it left on my hair and it cleansed gently without stripping. It’s part of my shampoo arsenal now and I expect it will last over a year since I shampoo so rarely. If you’re looking for a suitable gentle shampoo for dry and/or damaged hair, I would definitely recommend this shampoo. Price point – $. Learn more about Juice Organics PomSmooth Shampoo HERE. Organic juices of punica granatum (organic pomegranate juice)*, aloe barbadensis (organic aloe juice)*, vitis vinifera (organic white grape juice)*, sodium cocoate, decyl glucoside, coco-glucoside, glyceryl oleate, vegetable glycerin, capryl hydroxamic acid, caprylyl glycol, guar hydroxypropyltrimonium chloride, botanical extracts of prunus persica (peach extract), vaccinium angustifolium (blueberry extract), organic plant oils of olea euroaea (organic olive oil)*, oenothera biennis (organic evening primrose oil)*, linum usitatissimum (organic linseed oil)*, borago officinalis (organic borage seed oil)*, butyrospermum parkii (organic shea butter)*, oryza sativa (organic rice syrup)*, punica granatum (pomegranate seed oil), panthenol (Vitamin B5), citric acid, sodium cocoyl glutamate, disodium cocoyl glutamate, sodium lauroyl oat amino acids, sodium hydroxide. * = Certified organic ingredient. Get free shipping for the shampoo and conditioner when you sign up with Amazon Prime. Try Amazon Prime HERE.